BOMO’s work plan included the identification of Criteria Leaders (process owners and subject matter experts) within various PennDOT bureaus and divisions who shared responsibility for activities associated with the detailed scoring criteria in the OM module. Outreach beyond BOMO was necessary because PennDOT is considerably decentralized and not organized along the 14 OM criteria. Information sharing with Criteria Leaders would support the scoring effort, but required advance preparation and coordination. Criteria Leaders were contacted prior to their scheduled interviews and were provided with summary information about INVEST 1.0 and the data needed to support a response to the scoring criteria. The preparatory briefing information was readily obtained from the INVEST website. Initial interviews with process owners each lasted one to two hours depending upon scoring criteria. Follow-up interviews were scheduled with Subject Matter Experts (keepers of related data sets) to complete an accurate preliminary evaluation and generate the initial score. Criteria Leaders and Subject Matter Experts participated in a joint workshop, where individual criteria, associated data sets and initial scoring results were discussed for additional feedback. PennDOT BOMO’s preliminary OM score was 121 out of 210 points, achieving an INVEST Gold rating. The workshop identified information gaps and where needed information and data could be accessed. Attendees also elaborated on the level of interactivity and planning involved in BOMO that was not readily apparent during the more focused interviews. The workshop afforded the opportunity for broader information sharing about INVEST elements and feedback by the group. Preliminary scores were revised with the information gained as a result of the workshop, culminating in a final report, noting the findings of the INVEST 1.0 evaluation. Improvements in score from the workshop were realized in five OM Criteria. The final report contains a summary of findings for each of the 15 scoring criteria, and provides feedback on the scoring tool. 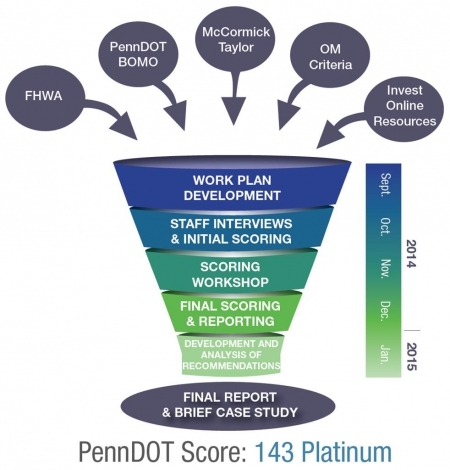 PennDOT scored 143 points of a possible 210 points, earning INVEST Platinum status. The scoring scale used by the INVEST OM module is not punitive as Platinum status can be achieved with only 60 percent of the total points available. Despite its seemingly low scoring threshold, the INVEST 1.0 OM module is very effective in cultivating a dialog that encourages and supports sustainability in all operations. Agencies considering using the INVEST tool to evaluate sustainability may consider the following commitments of time to plan their approach. Criteria Leader and Subject Matter Expert Interviews lasted between one and two hours with up to three agency personnel per session. As part of the evaluation, 28 interviews were performed. Time for preparation and data collection or verification was approximately two hours per person. A three-hour workshop with the scoring team and the 32 agency Leaders and Experts was performed. Data collection, review, and entry into INVEST accounted for an additional 50 hour effort. Coordination and planning meetings totaled 190 hours for the scoring team. Many PennDOT systems and processes are targeted for consolidation within months after the completion of this scoring module and will achieve further sustainability. These programs include a central Asset Management System, the Green-Light-Go program, a statewide Traffic Management Center, and modernization of current tracking and monitoring systems. It is anticipated that the result of any future INVEST evaluations will only benefit by these improvements. New programs and initiatives, including a focus on metrics and tracking savings related to sustainability, will be prioritized based on feedback from INVEST. Follow up with executive leadership to determine future efforts will be conducted once a change in administration is fully implemented. PennDOT will update its INVEST scoring annually.